– Sunrise Time. I typically like being there early enough to start shooting anywhere from 45 mins to 1 hour beforehand. Personally I reckon the best time for shooting sunrise (here in Australia) is from about 60 mins to 15 mins before sunrise. 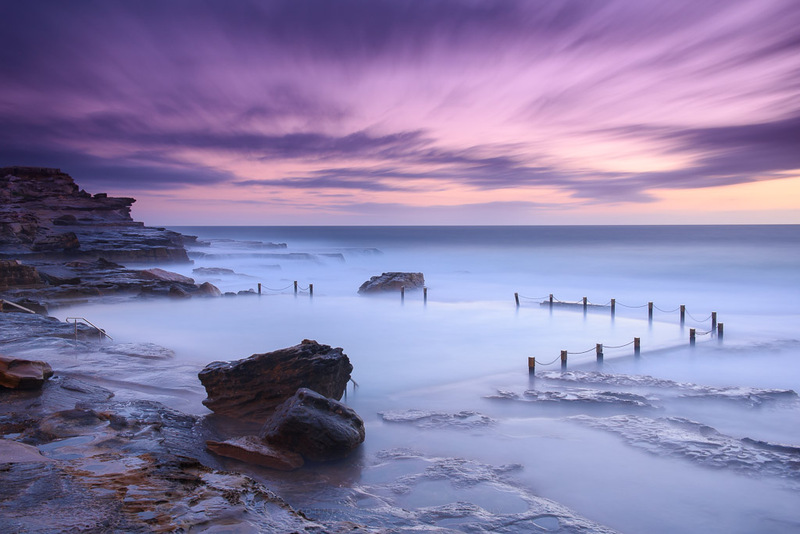 – Tide Conditions. Basically just want to know is the tide high, low, mid or whatever and is it going to be rising or falling whilst we are there. – Cloud Estimate & anything else (e.g. rain, wind, etc). This one’s a lot more random and unpredictable :). I’d done all that and more – looks like we’d be near high tide and predictions were for a partially cloudy and windy morning. Gerry mentions that there’s also a “dangerous surf” warning as well :). It was going to be one of those mornings. We get there and windy and rough is right :). 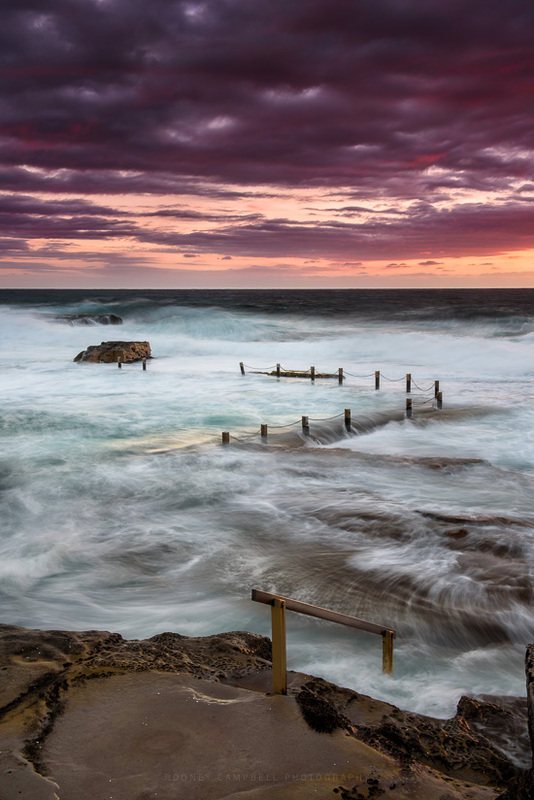 The water and waves were high, the pool and surrounds were drowned. No rain at least, but the wind and surf spray is pretty damn epic and annoying :). We decided to stay well back from the water – every now and then a couple rogue waves come in. If I’d shot in the sorts of places I usually would, well the chance of being very wet damn high, possibly even dragged out to sea :(. 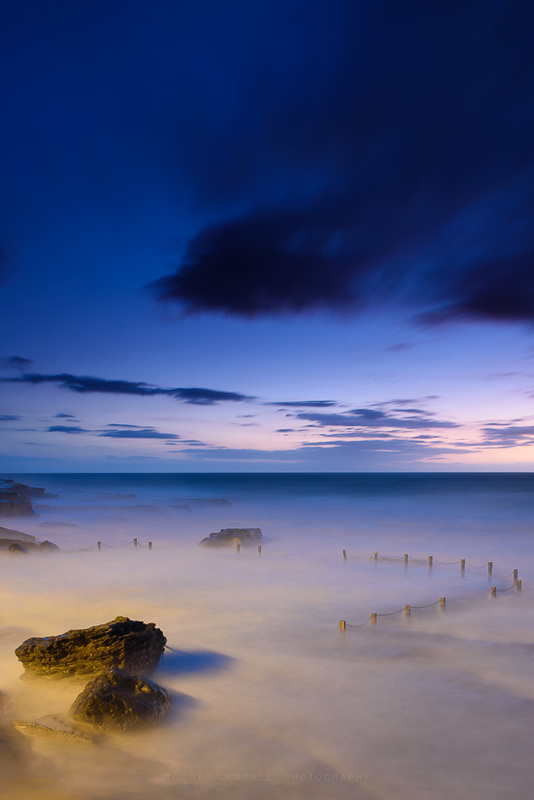 So unusually for me I find myself shooting seascapes with the 24-70 all morning. Instead of moving around I also find myself a relatively sheltered spot (out of the spray) and look to refine compositions rather than moving around everywhere :). Amazingly pretty much right on sunrise we started getting some nice colour in the sky. The best was early on but it did hang around for about ten minutes after sunrise. 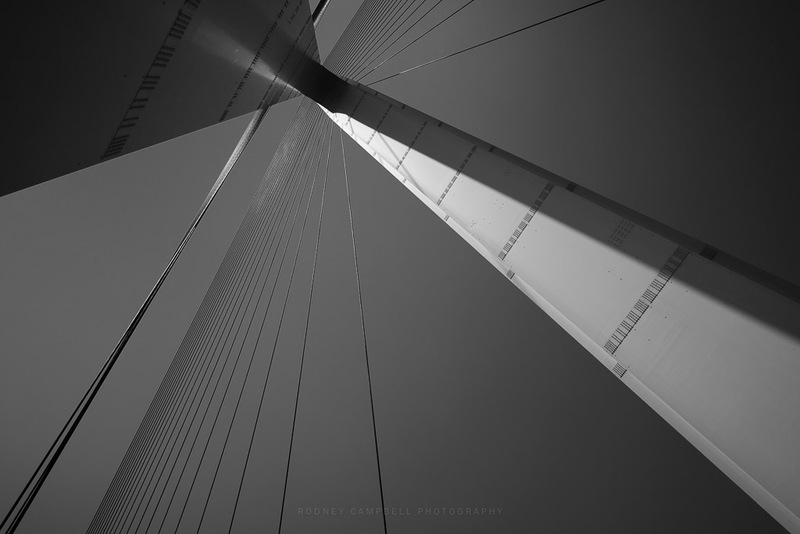 I’d settled on a composition (I was interested in this zig zag of man made lines set against the mystery of nature). Turned out to be a very nice morning after all. 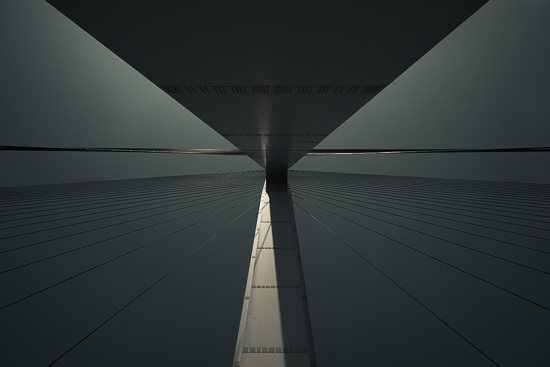 Tatara Bridge is a cable-stayed bridge that is a part of Nishiseto Expressway, also known as Shimanami Kaido. 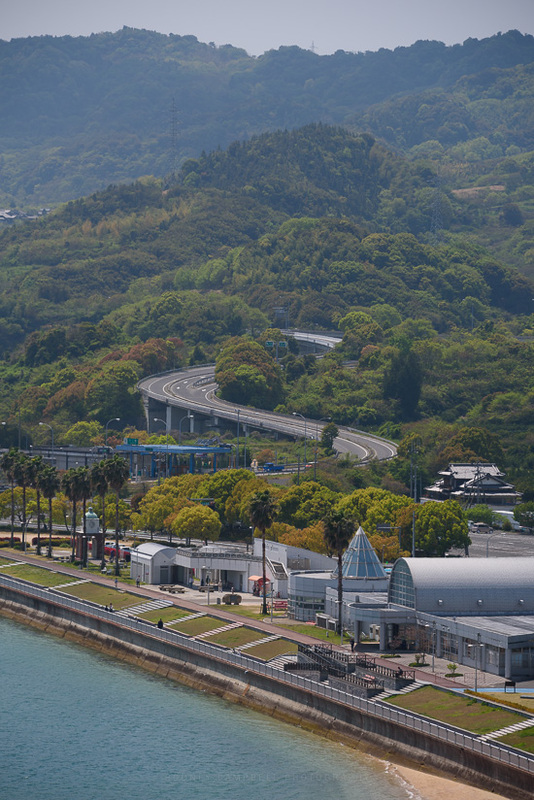 The connection is a series of roads and bridges and is one of the three routes connecting the islands of Honshu and Shikoku. Tatara Bridge was originally planned as a suspension bridge in 1973. In 1989, the design was changed to a cable-stayed bridge. By building a cable-stayed bridge a large excavation for the anchorages would not be needed. This would reduce the environmental impact in the area. The steel towers are 220 metres high and shaped like an inverted Y. The bridge has a centre span of 890 metres. The bridge opened in 1999 and has two lanes of traffic in each direction. Keen observers (and those of you living here in Sydney) will also notice it’s distinct similarity to the Anzac Bridge here in Sydney. Using a slow shutter (long exposure) is one of my favoured photographic techniques. 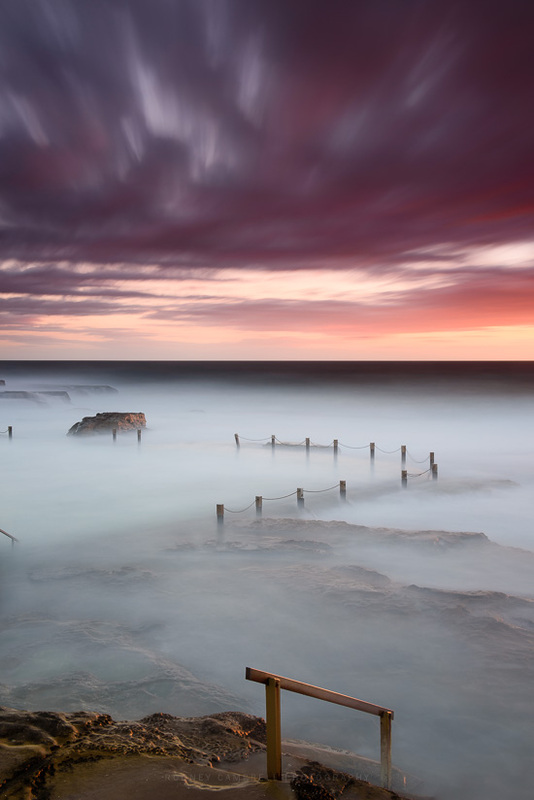 I’m often thinking about how I can incorporate slow shutter into my imagery. It has a distinctive look and simplification of the scene that I really find appealing. As is usual 🙂 for my friend Gerry, he sent me a late night invite to join him for a sunrise session the next morning. Interestingly the planning for this actually didn’t take much longer than 5 minutes (normally there’s a flow back and forth of failed suggestions before eventually locking something in). Perhaps I was just tired – I caved immediately and just said yes to the first suggestion :). 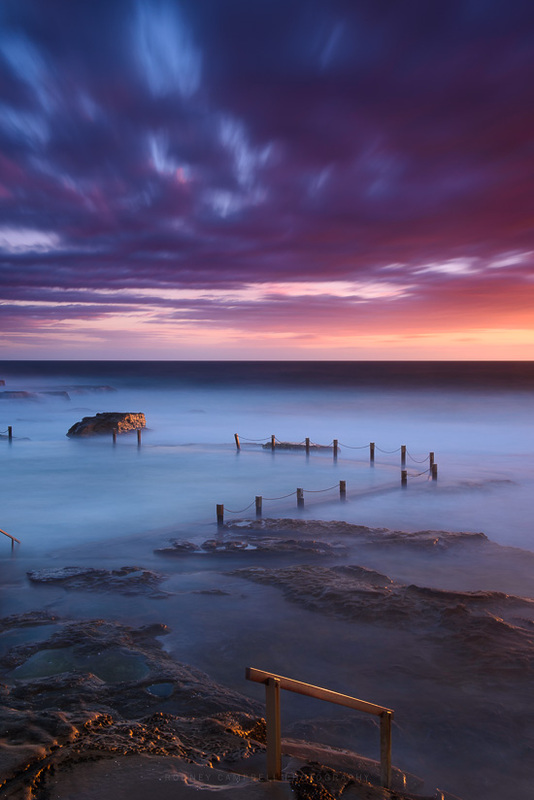 So we met around 5:15AM at Mahon pool at Maroubra, in Sydney’s Eastern Suburbs. 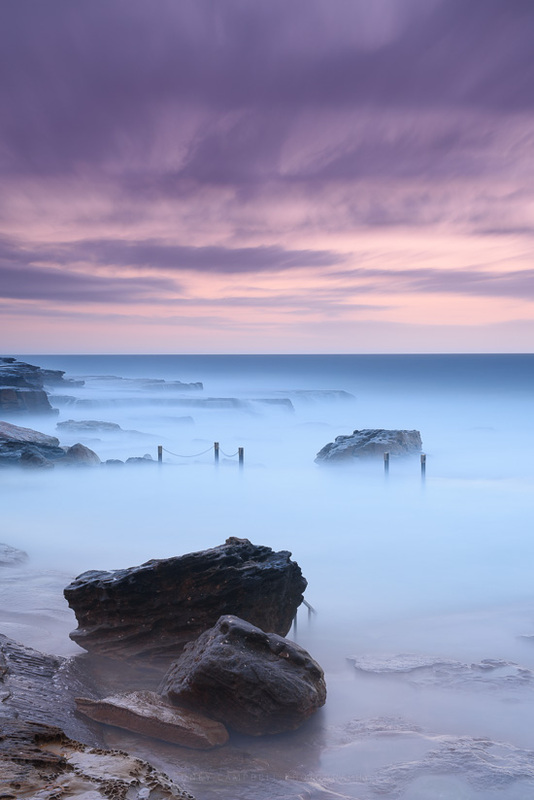 Sunrise wasn’t till 6:06AM this morning so even starting shooting at around 5:30AM we had some time for some natural long exposures before twilight really kicked in. The slow shutter technique is something I can turn to when things aren’t totally working for me otherwise. I took two images from essentially the same spot with roughly the same composition only minutes apart. 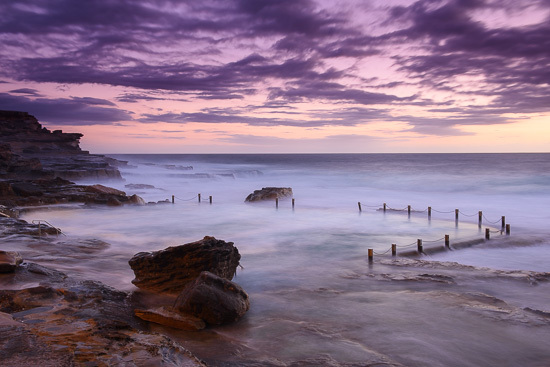 The first image is a simple natural exposure with a Polariser and 3 stop hard grad filter. It’s technically still a slow shutter (10 seconds) but personally I don’t call it a long exposure till I get to bulb mode (> 30 seconds) :). To see the difference slowing the shutter right down can make I’ve added a Lee LittleStopper (a 6 stop ND) to really extend the exposure time. I had to bump the ISO a little so it wasn’t too insanely long (especially since I generally just wing my exposure times in bulb mode as I’m going along). Anyway 255 seconds later we have this variant with a very different feel to the scene. Travelling by car and having some local relatives on had as tour guides afforded us the luxury of going to some places normal tourists would not. Most tourists would travel on the Shinkansen (bullet train) from Kyoto to Hiroshima completely bypassing everything inbetween. They certainly would be less likely to stray far from the areas along that train line. 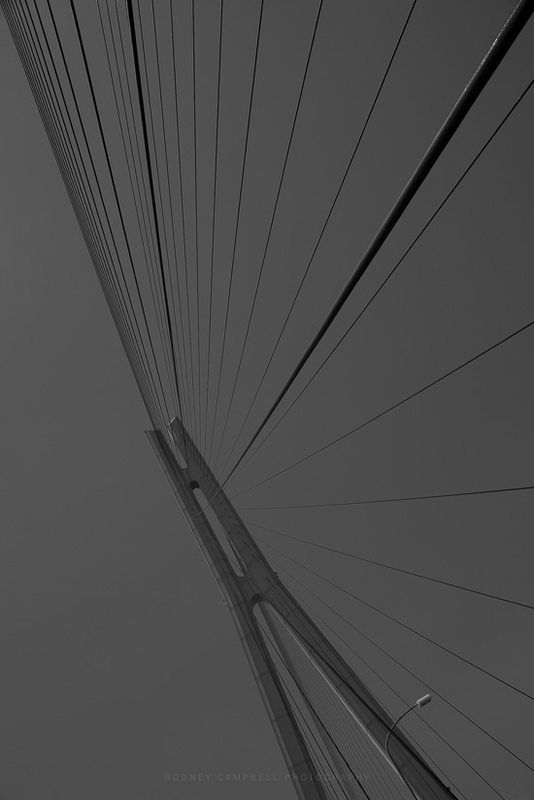 The Shimanami Kaido (しまなみ海道, Shimanami Kaidō) (kaido – literally means “sea road”) is a 60 kilometer long toll road that connects Japan’s main island of Honshu to the island of Shikoku, passing over six small islands in the Seto Inland Sea. It is also known as the Nishiseto Expressway. 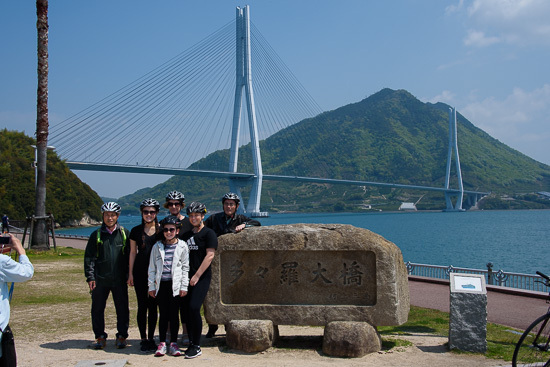 There are two other land connections between Shikoku and Honshu, but the Shimanami Kaido is the only one traversable by foot or bicycle. The Shimanami Kaido begins on Honshu in Onomichi City. It then leads across the six islands of Mukaishima, Innoshima, Ikuchijima, Omishima, Hakatajima and Oshima, before terminating on Shikoku in Imabari City. The route was opened in 1999, so the bridges are modern and attractive. Along the way, travelers can enjoy the beautiful scenery of the Seto Inland Sea and the islands’ small towns. 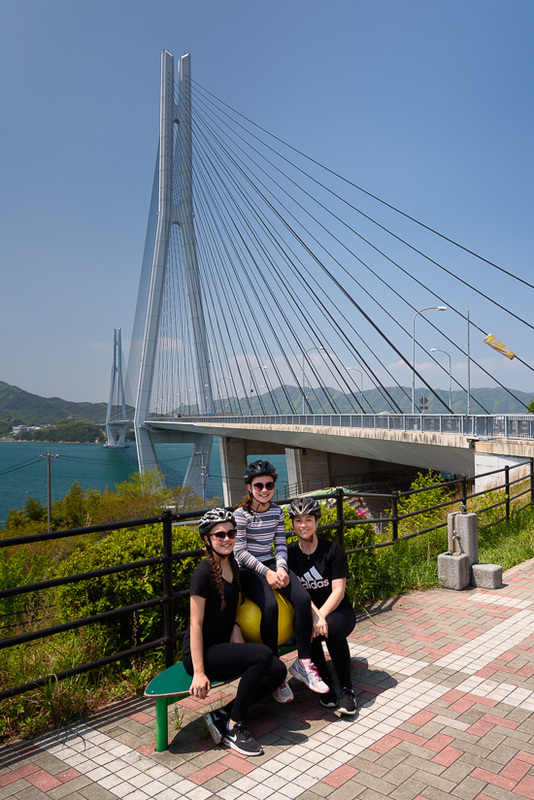 Cycling is a popular means of experiencing the Shimanami Kaido. The bicycle route is well marked and maintained, and diverges from the expressway on the islands. The ramps leading up to the bridges were built at small inclines with cyclists in mind. We didn’t cycle the whole route however we did cycle over and back across one of these fabulous bridges and around part of one of the islands. 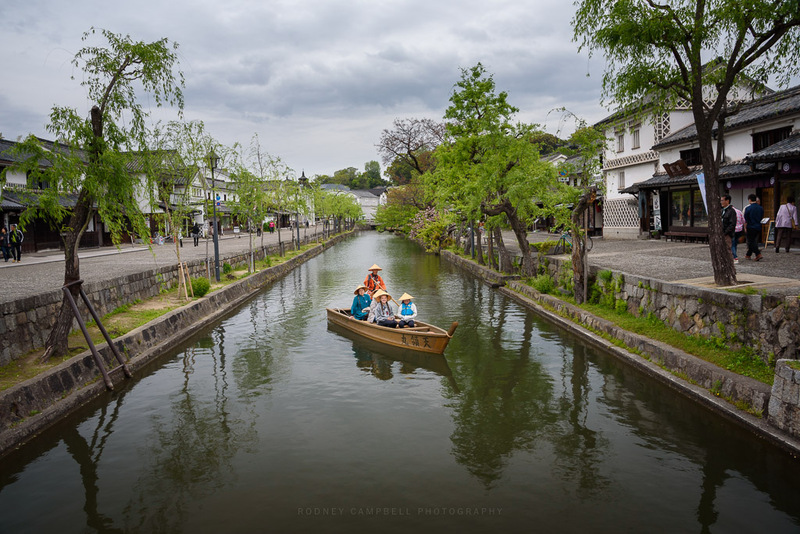 Kurashiki (倉敷) is a historic city located in western Okayama Prefecture, sitting on the Takahashi River, on the coast of the Inland Sea. 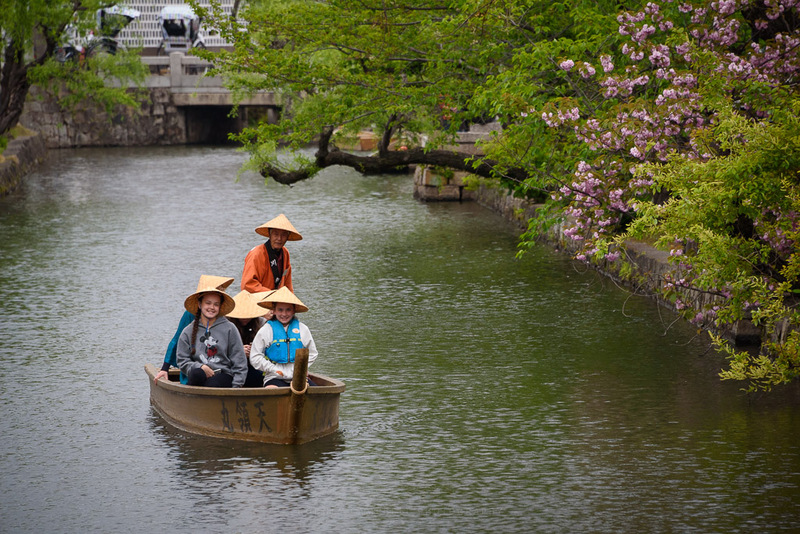 Here it has a preserved canal area that dates back to the Edo Period (1603-1867). At the time the city served as an important rice distribution center. 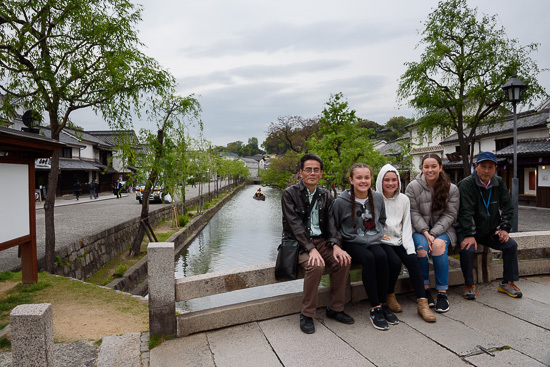 In fact, the name Kurashiki can be roughly translated as “town of storehouses”. Many of Kurashiki’s former storehouses have today been converted into museums, boutiques and cafes. Near the famous Ohara Museum of Art (which was unfortunately closed today :() there is a lovely small stone bridge. It was an ideal spot for a wide all encompassing panorama. 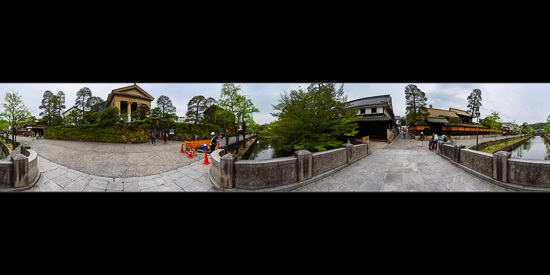 This 360˚ horizontal panorama is composed of seventeen (17) vertical frames (taken handheld). It is perhaps a little surprising that a handheld job sticked so well. However it shows what a little planning, practice and good modern software can do :). The old merchant quarter is called the Bikan historical area. It contains many fine examples of 17th century wooden warehouses (kura, 倉) painted white with traditional black tiles. Bikan lends itself to relaxed strolling. There are no cars to avoid, and none of the poles and overhead wires in order to make it more closely resemble the look of the Meiji period. The canal is lined with willows. There are the requisite Japanese carp (koi) finning about in the river and several swans. For a small fee you can take a relaxing boat ride along the canal. My three daughters made full use of the opportunity :).